The Smanos W100 wireless alarm system offers peace of mind by securing your home with easy do it yourself simplicity. The sleek modern design with built-in touch panel blends in to your home decor allowing it to be installed in a convenient central location. There are no set up fees or ongoing monitoring fees to pay. The W100 features dual connectivity with both Internet (WIFI) and PSTN (telephone) connections. In case of an alarm, the loud 110dB siren will sound, a push notification will be sent to your smartphone(s) by Internet connection, and it will dial up to 6 emergency telephone numbers to announce the alarm. The W100 alarm can be monitored armed and disarmed remotely using the free iOS or Android app or by calling in to the home phone number. 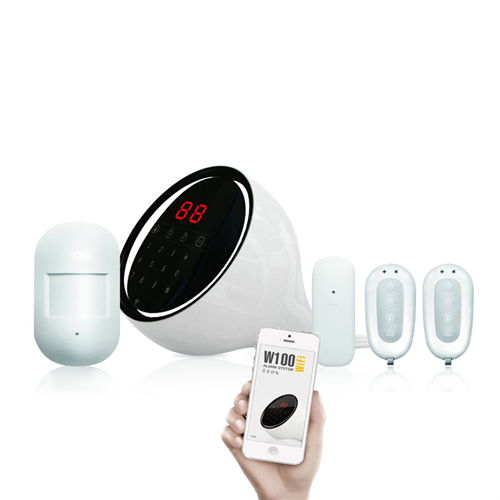 The pre-configured W100 kit includes a wireless motion detector, a wireless door/window sensor and two wireless remote controls for arming or disarming the system as you come and go. The built-in touch pad also provides quick access to arming or disarming the system. The system can be expanded up to a maximum of 30 wireless sensors and up to 10 wireless remote controls so it can adapt to your home and family size. The sensors are mounted with screw kits or double sided tape for quick and easy setup. Note: Digital telephone systems are note supported.